Condition Mint Never Hinged MNH. Condition Mint Never Hinged MNH. Get Images that. Make Supersized Seem Small. Centennial trees in Cyprus, 2019. Such trees have managed to survive both bad weather conditions over the centuries as well as the disastrous insanity of fire and the inconsiderate human actions. Their existence runs alongside many important historical events and it is often connected to the traditions, myths and legends of our long-suffering island. CYPRUS 1967 Europa Cogwheels. Set of 3. Mint Never Hinged. SG302/304. CYPRUS 1967. Mint Never Hinged. CYPRUS 1969 Europa. Set of 3. Mint Never Hinged. SG331/333. CYPRUS 1965 Europa Sprig. Set of 3. Mint Never Hinged. SG267/269. Complete UNMOUNTED MINT set of 3 in NEW condition. A very fine set! CYPRUS 1964 Olympic Games Tokyo. Set of 3. Mint Never Hinged. SG246/248. 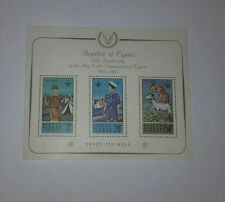 Complete UNMOUNTED MINT set of 3 in fine condition.